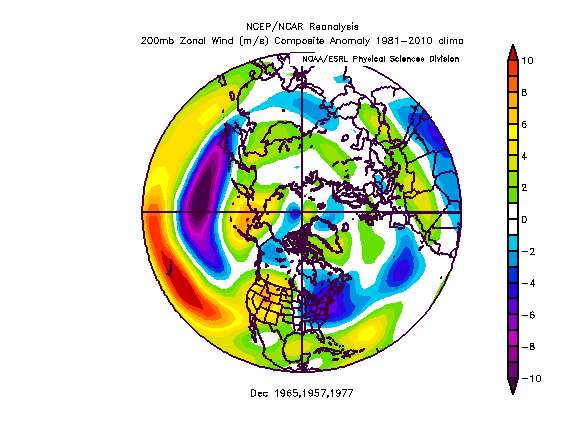 My previous post discussed the potential for tropospheric pattern changes in early January. This largely appears to be on track. The initial change anticipated was the development of more conducive NPAC Geopotential heights. Over the past couple of weeks, we’ve seen the primary inter-seasonal +ENSO forcing cell retrograde westward, while contemporaneously, there has been a gradual dampening of the walker cell induced convective flare-up in the western tropical Pacific. I think this convection has been interfering with the MJO plots, masquerading as a MJO signal. However, the upper divergence plots are not suggestive of a propagating wave at 200hpa, and thus, I am more inclined to believe that a reorientation of the walker cell is promoting increased suppression over the E IO/WPAC and enhancement of convection closer to the international dateline. Further, it is highly unlikely that a MJO wave of the progged amplitude would be present in this very potent El Nino regime. Stratospherically, the prior post discussed the development of a favorable tropospheric precursor pattern earlier in December which would initiate stronger wave activity flux in late December. There is a robust pulse of energy propagating from the troposphere into the stratosphere right now, as evidenced by the recent significant warming of 10hpa temperatures, in addition to improved poleward eddy heat flux. 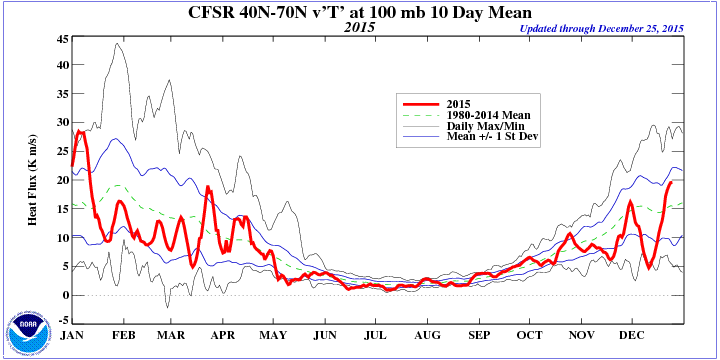 Heat flux has increased to values of approximately 1 standard deviation above normal; however, we are still somewhat early in the stratospheric perturbation process, with much stronger burst(s) of heat flux likely to occur in a couple of weeks. The enhanced wave-1 EP flux will promote the pressing of warmth up against the stratospheric vortex and consequently an elongation, such that the vortex circulation becomes more asymmetrical. This – in concert with variations in ENSO related forcing – will act concurrently to promote increased mid level Geopotential heights over the Western US/NW Canada/Alaska. The PNA (EPO) should turn positive (negative) by the first week of January as a result. Over the next several days, there will be important changes in the northern hemispheric circulation pattern with a transition into a regime which arguably could not be much more conducive for both wave-1/wave-2 forcing. This week’s tropospheric circulation is such that the ridges / troughs are generally destructively interfering with wave-1 and especially wave 2 activity, which is why there will be a transient relaxation in wave activity flux at the end of December / beginning of January. However, the developing tropospheric regime will rapidly increase wave driving such that stratospheric vortex perturbation significantly increases in the second week of January, and should reach a climax around January 20th. I still think that circa January 20th is a reasonable time frame for a potential sudden stratospheric warming event (most likely displacement). 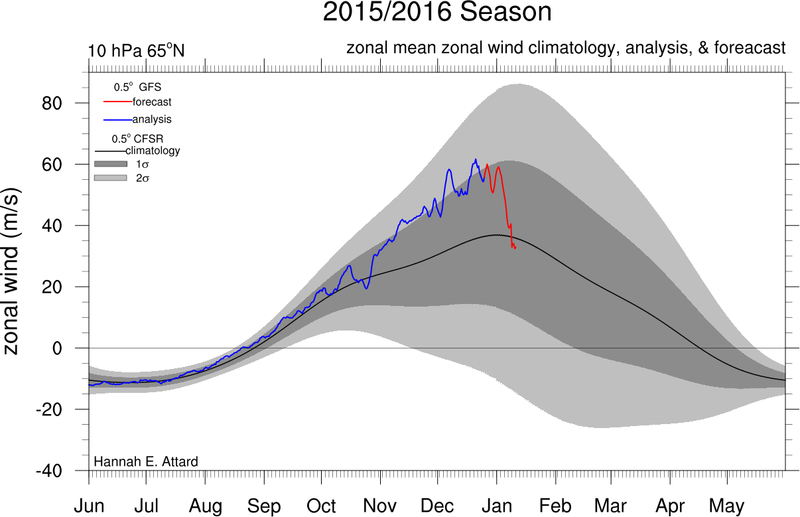 The zonal mean wind anomalies at 10hpa/65N are progged to decrease significantly in early January, down to more climatological levels. History indicates that vortex intensification usually peaks immediately prior to a rapid deceleration of the mean zonal winds. This forecasted decline, when examined in conjunction with other data, suggests that the stratospheric vortex should continue to weaken in the first half of the month. However, as previously noted, the most robust burst of WAF will likely wait until the middle of month. Although any sudden stratospheric warming event is still probably at least 3 weeks away, the tropospheric changes occur well prior to that event, as outlined in previous discussions. The reversal of the RNA pattern / -PNA into a predominately +PNA regime is occurring essentially in tandem with similar past El Nino episodes. 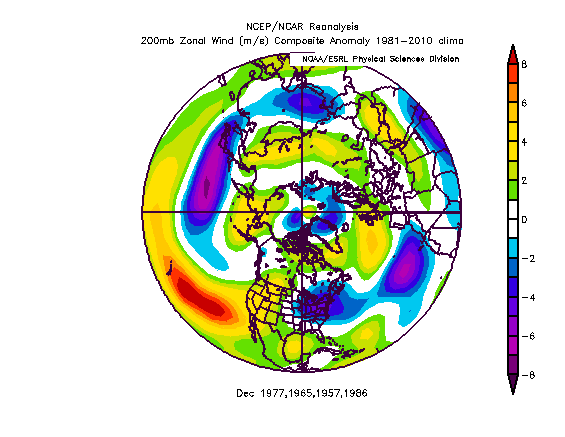 The PNA in 1977, 1957, and 1965 shifted from negative to positive (in a sustained fashion) in the first week of January. This year should feature that transition around New Year’s Day, which is not unexpected given the available statistics and tropospheric pattern progression. The upcoming perturbation of the stratospheric vortex, particularly following increased energy transfer via Geopotential height changes in the eastern hemisphere, should act to weaken the tropospheric vortex, resulting in significant height rises by January 7th. The expectation has been for the neutralization and bias negative of the northern annular mode to begin in the second week of January. This idea is still on track, and current model data supports that notion. Some recent ensemble guidance indicates that the AO could become strongly negative as we approach mid January, which is a possibility, particularly in light of prior similar years. 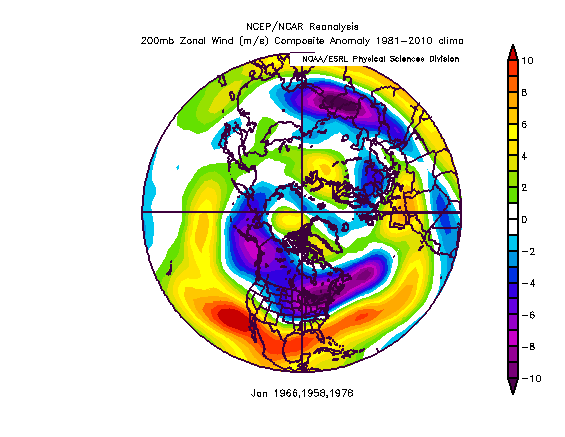 The AO in January 1958 plummeted to around -3 standard deviations near mid month, for example. Going forward, one may wonder if the upcoming regime will feature predominantly dry conditions devoid of the classic El Nino induced sub-tropical jet. Upon examination of prior El Nino’s in which the NPAC pattern shifted from RNA / Western trough to +PNA / Western ridge in January, one will find that there was a significant eastward extension of the sub-tropical jet across the southern/southeastern US. Thus, as the GOAK vortex begins retrograding into the Aleutian Islands for the month of January, I anticipate that the sub-tropical jet will extend further northeast, thereby increasing opportunities for southern stream waves and/or phasing with the northern jet. The pattern initially, in the beginning of January, may not be one that promotes significant snowfall in the I-95 corridor. Without high latitude blocking in the Arctic/Atlantic, there may not be sufficient backing of the mid/upper level flow to direct short waves along the coast. However, I expect that the rapidly improving Arctic heights, and eventually NAO, should promote increased probabilities for significant coastal snow. Although the magnitude of December’s warmth was historic, the pattern reversal should be quite impressive. The totality of indicators – some of which were alluded to in this discussion – are suggestive of an overall continuation of an active / blocky pattern for the remainder of the meteorological winter, once that pattern fully develops over the course of the next 1-3 weeks.